Blogging is a way of sharing your view, content over the Internet for needed people. But, sharing your useful content post with others may be a hard nut as there are lots of social networking and bookmarking sites to which every blogger wants to share his/her content to get web traffic for its blog. If you are running a blog alone, it may be difficult to share your blog on different social sites at a time. And, result is that it harms your presence and your blog value on the Web. To solve out this problem, i have found the ways to auto-share ones blog content over the social sites whenever you post useful content on your blog. It lessens the worries to every time share each post on hundreds of social sites. Although, there are various free plugin for WordPress users, yet nothing is specific available for Blogspot blog users who have limited access to tools for his/her blogger blog. - It is true that free plan gives you limited sites to access for your sharing and it is not possible to share your each post on hundreds of social and bookmarking sites without paying to third party which helps you in this. There are various Premium sites available that provides services to share your posts on social sites on which you want to share and have a account. But, for the bloggers who don't want to invest much initially in promoting their blog. I have found a solution which may not rid of you from this problem, but yes it may help you some what. Above mentioned list are those sites on which auto-share is allowed free by the sites or apps. Now, let's brief about the app which let you help in sharing your blog posts automatically. This is the basic option provided to every blogger in its setting to share content on Google+. You might have seen this setting in your Blogger.com Blog page, where you can choose an option to auto-share your blog post on Google+ page, whenever you post an article. One can also select on Page or Profile of Google+ wants to share his/her blog posts. 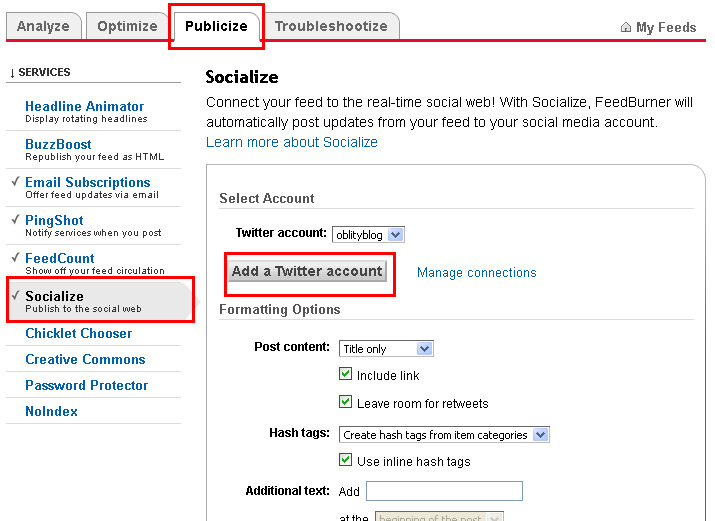 Here you will see the special settings to tweets your blog links on Tweeter page. This also allows you to suffix or prefix different hashtags extracted from the links your sharing. Hence, it prefectly and efficiently manage your feeds and tweets both. That's one of the great application, i must say. It is very easy to get a free account on Buffer.com and link your social profiles of Facebook, Tweeter, LinkedIn, Google+. And, this available is FREE. It also gives tools to check the stats of your posts shared on these sites and how people engaged with your content and how many clicks you got. One must try this app to manage your different profiles at one place. That's another awesome app. It is very easy to signup on it and choose free 3 social sites which you want to manage for FREE. Then, add feed URL and add social sites account where you to feed your blog links. Dlvr.it does it automatically in real time and allows you to change the settings like you can add suffix or prefix before every link you want to post, or you can also allow dlvr.it to post links after every hour or you can also post previous posts on your blog on social sites. Like Buffer app, it also provides data of people reached to your link and how many clicks you got. You can save settings to get email about these stats. It is totally free and easy-to-use. Post on popular social networking sites. Provides free data to check how people engaging with your shared links. Limited number of sites can accessed. No bookmarking sites like Delicious, StumbleUpon, Digg, etc can be managed by premium account. Premium account more than building a premium blog. Hence, difficult for newbie bloggers to buy these plans. Comments "4 free tools to auto-share your Blogspot Posts"